At the Exeter City F.C. end of season Awards Night, Hawksmoor Business Development Manager Jill Gill presented the Hawksmoor Investment Management ‘Fans’ Player of the Season’ award to goalkeeper Christy Pym. Hawksmoor has been sponsoring the popular Player of the Month award this season – with the winner being decided by votes from Grecians’ supporters. 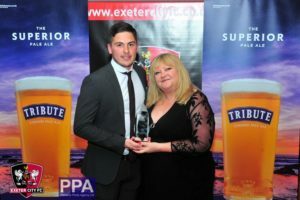 Christy has won this award several times, but due to a string of match saving performances (including 13 clean sheets) he was also voted the fans’ overall Player of the Season.